The state of Madhya Pradesh is full of surprises and hidden wonders. Hence, it serves each and every traveller with innumerable destinations. One such destination, which remains flooded with tourists throughout the year, is Indore. Located near Bhopal, this metropolis is one of the advanced cities of Madhya Pradesh. However, the major reason behind its popularity amongst tourists lies in its intact beauty and unblemished environment. Also known as the cleanest city of India, Indore has everything which has been alluring tourists from all over the state. If you are looking for a green city to spend your summer weekends, then it is advisable to plan a trip from Bhopal to Indore now. On one hand you can visit its beautiful palaces and temples within the city and on the other hand, you can explore its natural beauty outside the city. Read on to know more about how to reach Indore and its places of interest. The region in and around Indore experiences a humid subtropical climate and hence, the summers are hot here. However, due to the presence of several natural spots around the metropolis, it remains a year-round destination for nature lovers, who come here to visit its beautiful waterfalls and hills. If you are looking forward to escape the hot sun of Indore, then the best time to visit is from September until the end of March. By Air: Indore is well connected to other major cities in India by air and hence, you can catch a direct flight from Bhopal to Indore. By Rail: There are direct trains available between Indore and Bhopal. Hence, you can catch a train from Bhopal railway station to Indore Junction. It will take you an approximate time of 5 h to reach your destination. By Road: If you are looking forward to driving on your own, then a road journey to Indore from Bhopal is the most preferred mode of transport as Indore is located at a distance of just 190 km from Bhopal. As route 1 will take an average time of 4 h to reach your destination, i.e., 3 h lesser in comparison to route 2, it is the most convenient and fastest route possible. On your way to Indore, you can also visit Dewas. Dewas is located at a distance of around 150 km from Bhopal and 40 km from Indore and hence, it is a perfect place to take a break on account of its interesting tourist spots. It is famous amongst tourists for its temples and ancient sites. However, it is also gaining popularity for its natural surroundings amongst offbeat travellers. The major places to savour here include Kheoni Wildlife Sanctuary, Kavadia Hills, Pushpgiri Tirth, Devi Chamunda Temple, Mahadev Mandir and Gidya Khoh Waterfall. Once you have reached the beautiful lands of Indore, you have numerous spots to explore and savour. From palaces to temples and waterfalls to lakes, Indore is all set to surprise you with its hidden beauties. Even though the foundation of Indore is unknown, it is believed to have been founded in the Medieval Period of India and since then, it has been a major political and commercial centre. Ruled by several dynasties, Indore is named after Indreshwar Temple dedicated to Lord Indra and is located within the city. Following are the must-visit places here. One of the few metropolis which are also known for their natural surroundings, Indore hosts several waterfalls which include include Patalpani Waterfall, Tincha Falls, Mohadi Falls and Sitlamata Falls. If you are looking to enjoy the best of Indore district, then these waterfalls are the must-visit destinations for you. When the talk is about Indore, its palaces can never be kept out of the discussion. The major palaces here include Rajwada Palace and Lal Bagh Palace. Rajwada Palace was built by the Holkar dynasty during the 18th century and is wonderful masterpiece of Indo-Saracenic Maratha architecture. The use of beautiful patterns and intricate designs over the walls and the ceilings are certainly commendable. Lal Bagh Palace, on other hand, is a 19th century beauty with ravishing architecture, grand halls and exquisite surroundings. 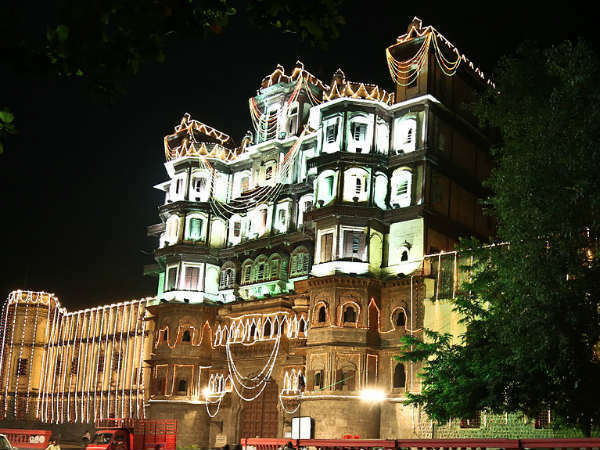 You must catch a glimpse of these two palace while in and around Indore. Being one of the cleanest cities in India, Indore harbours beautiful parks and gardens to maintain the natural beauty of the city. The major parks and gardens here include Atal Bihari Vajpayee Regional Park, Nehru Park and Meghdoot Upvan. Apart from all these places, you can also visit Krishnapura Chhatri, Kanch Mandir, Daly College, Khajrana Ganesh Temple, Central Museum, Ralamandal Wildlife Sanctuary, Gommatgiri, Annapurna Temple and Indore Church.